Catering and the Outdoors mix, but mix in the right circumstances. It is a difficult task to balance an excellent, planned, and well-thought catered event with something that is very unpredictable, namely, the outdoors. Catering an event inside is a simple task. Most places are climate-controlled and will have appropriate venues for the occasional accident or mishap. When you take your catering outside, however, additional planning steps need to be accounted for. Does outdoor catering make sense for you? When talking with a client who would like to cater an event outside, be upfront and honest with them about potential issues and problems that may occur. Things like the weather and insects should be discussed frankly and openly. The client will need a complete understanding that if a catastrophe does occur, they are still responsible for the services provided. The caterer, on the other hand, should have as many possible fail-safes included in their plan for almost any situation. Many events requiring catering are booked well in advance of the planned event. The weather is not something, even with incredible advances in meteorology, that can realistically be forecast beyond a few days. Again, honesty and being forthright are important in a caterer/client relationship. 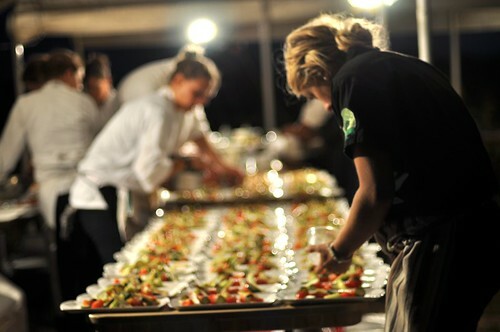 For the caterer, a unique set of difficulties exist to be sure that even if there is a potential for a disaster that every possible situation has a contingency plan. Tents are the first thing that should be ready for the caterer. Tents that are quickly assembled and in place in moments are absolutely necessary. A tent or set of tents will prevent the event’s food from total loss. In the case of a hot line, extra cans of fuel should always be brought along as well as guards to shield from wind gusts and moisture. With cold food, extra ice is always appreciated. When in doubt, have more ice than you think you need for the event. If you expect 20 people, have enough ice to satisfy 40 people. Special foods, such as cakes and wedding cakes, should be kept as cool as possible as long as possible. If the event is held at a host home, ask to keep the cake in a refrigerated area until the time to cut the cake. Icing may slip and fall in hot, humid weather so prevention is paramount. Finally, have a backup plan. Be ready and willing if need be to move the catered event indoors. It may not be exactly what was wanted, but at least the event is saved. 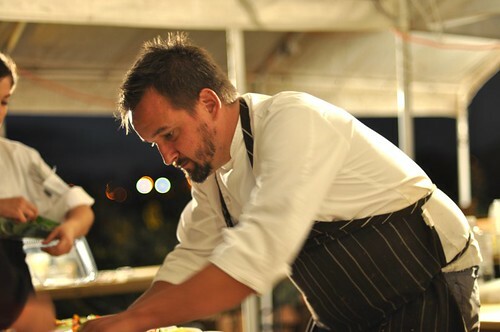 This article was written by ezCater.com the leader in catering online catering. Ezcater was founded in 2008 and provides, Boston, Atlanta, and Phoenix catering among other locations.